Essentially, you need to have firewalls fully implemented on your site. 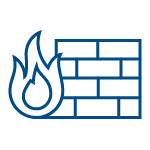 There are three basic types of firewalls: hardware firewalls, software firewalls, and web application firewalls (WAFs). Typically, an infrastructure has a combination of hardware and software firewalls, along with ones specifically designed for web applications, because apps create their own unique challenges and have become such a frequent target for intrusions. Making sure that technology is system-wide is one of the HIPAA compliant server requirements. Firewall is actually a kind of broad term. It refers to a hardware or software system (i.e., physical component or an app) that is used to secure a network, via a set of rules that control the traffic that’s entering and exiting it. The hardware/software distinction is just one way to categorize firewalls, though. As indicated in the US Department of Commerce’s NIST firewall guidelines (Special Publication 800-41), and as expanded by TechTarget, five primary types of firewalls are application-level gateways (proxies), circuit-level gateways, multilayer inspection firewalls, packet-filtering firewalls, and stateful inspection firewalls.